An awe-inspiring experience awaits you in this part of Africa. Share the Mountain Gorilla's family space, soak up the serenity found in nature and marvel at the abundance of primates in this magical spot. Positioned on the foothills of the Virunga Volcano range this beautiful lodge provides breathtaking views of Rwandan hills and the slopes of the Volcanoes National Park. Situated in Northern Rwanda's Musanze district, Gorilla's Nest Lodge is nestled in a forest of Eucalyptus trees. The Gorillas Nest Lodge recently sustained fire damage to its main public building. This has limited the operational capacity of the lodge until the main Lounge and Dining Room are restored. Guests are hereby notified that some noise associated with demolition and reconstruction of the main public building, limited to normal daylight hours, is likely. The owners and management of the property apologize for any inconvenience caused and wish to assure all guests staying on the property in the intervening period of continuing excellent and personalized service. A scenic 90 kilometre drive from Kigali leads visitors to this lush destination. The Lodge remains open for single family or groups of up to 8 people, who will be accommodated in the famous Hanna Cottage (max 4) and adjacent Ranch Rooms (max 4) on the property with all meals prepared by a private chef in the Hanna Cottage. The Hanna Cottage was recently renovated to 5-star standards and ranks as the finest accommodation available in the region. 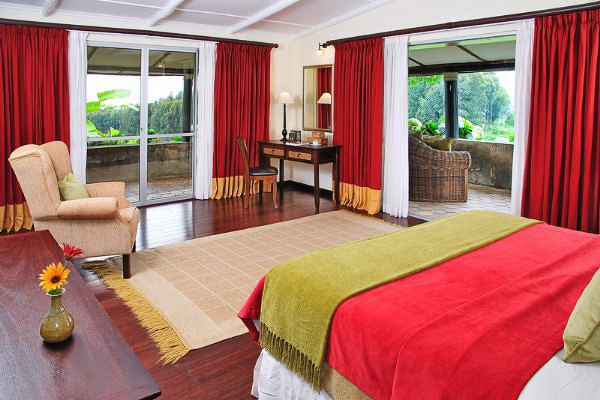 The lodge offers 9 standard rooms overlooking the luscious golf course fairways and Volcanic Virunga Mountains, 9 standard rooms snugly tucked into the forest, 1 apartment and the Jack Hanna owned 2 bedroom cottage, overlooking the mountains, golf course and the Volcanoes. Bringing guests in close proximity to the largest family group of Mountain Gorillas in the Virungas the lodge ensures a peaceful stay and an un-paralleled nature experience. Activities include Mountain Gorilla trekking, Golden Monkey trekking and visiting Diane Fossey's Karisoke Camp. Luxuriate and enjoy authentic African cuisine and expertly prepared international dishes in a cozy and traditionally African atmosphere.